Rusticus, that erstwhile town buck now turned country gentleman, obliged the Listener (and his readers) and returned to London, for the purpose of recording what it is like to re-enter Society. This he did, detailing a progression of experiences during one night on the town which tended to arouse discomfort in others and disgust in himself. Self-conscious of the figure he would cut, Rusticus began his preparations at 3 o’clock in the afternoon. It was a good thing, too, that he began these early, as he encountered considerable difficulties making his person presentable. Summer recess ball dress: frock of white crape, Venetian gauze, richly embellished at the border with small double Indian roses of a beautiful pink colour, and mingled with leaves of crape and pearls…the headdress consists of a double wreath of Indian roses…white satin shoes and white kid gloves. Meanwhile, articles of the latest in London fashion had arrived. From the great English bootmaker Hoby–six pairs of dress shoes, none of which fitted very well. Indeed, “the pair I kept were so short and tight round the heel that they took my skin off.” His tailor fared no better, and our returning hero was obliged to wear an overly large pair of cream Kerseymere short clothes, “for the fear of the consequences of having (the black satin ones) too tight.” It was not until 5 o’clock that his brand-new shirts, “frilled in the finest French cambric,” returned from the laundress, imperfectly pleated and still damp to the touch. Torture indeed, for the night was only just beginning! 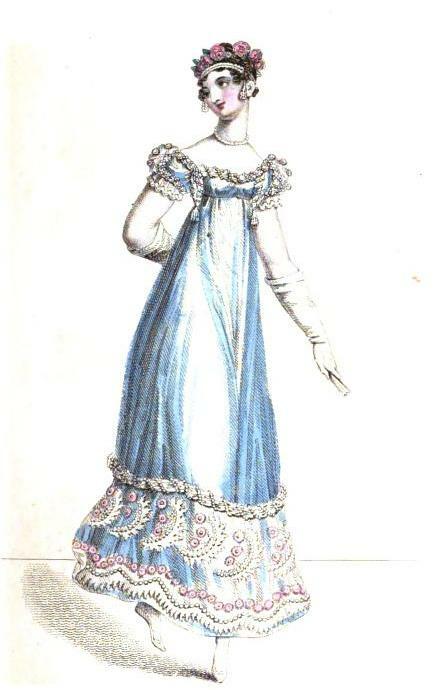 This entry was posted in Regency, Uncategorized and tagged La Belle Assemblee, Regency dinner party, Rusticus, summer recess ball dress by Angelyn. Bookmark the permalink. I like this. Very interesting glimpse into a man’s life. I love these posts!! Thank you, Angelyn! A wonderful post on a Regency man getting ready to go out. I loved this! And who can’t relate? Rusticus has real life problems like too tight clothes, unruly hair, and shirts that were ruined by the laundress! Thanks for the compliment, Mimi! You’re right–that was a little bonus to find how we can all relate to a former Regency buck.